Astronaut Scott Kelly returned from a year-long sojourn in space in June. His slightly older astronaut twin, Mark Kelly, stayed home as a control—part of NASA’s twin study to monitor the effects of space on the human body. But there’s a physical change that NASA might not be able to measure that easily. 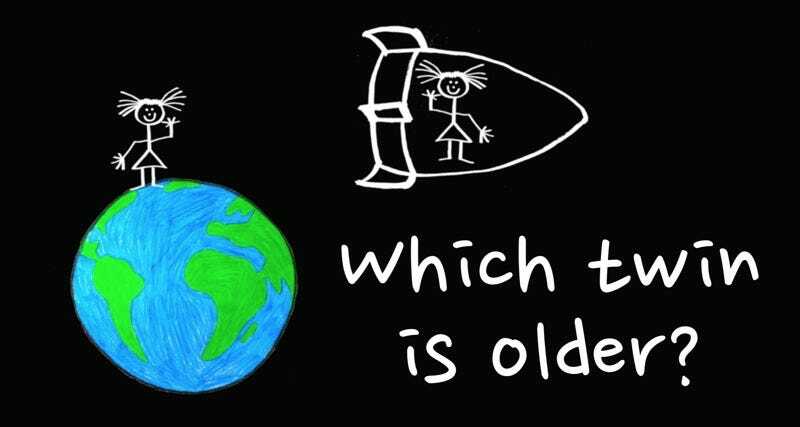 Mark is now even older (by about 5 milliseconds) than his space-faring twin, thanks to special relativity. It’s due to a quirky little thing called time dilation: time can slow down for one person, but not for another, because there is no such thing as a fixed frame of reference against which all motion can be measured. Two people who are moving relative to each other, wearing identical watches, will measure time differently, depending on how fast each is moving. Why does this happen? Well, the three dimensions of space and one dimension of time are merged in Einstein’s theory to become a single four-dimensional spacetime. That means motion through time and motion through space are connected, and light is the link between them. Since the speed of light in a vacuum is always constant (670 million MPH), time and space must adjust with motion to ensure that two people moving relative to each other will always measure the same speed for light. So as an object speeds up as it moves through space, time must pass more slowly. (Also, lengths contract.) But from your perspective, nothing would seem amiss. To put it another way, time passes differently for the hypothetical twins in the video because they haven’t had equivalent experiences. One stayed home in an inertial frame of reference. The other accelerated out to space, then decelerated, turned around, and accelerated home of the return trip. So the symmetry between them is broken. And as you may recall from Interstellar, time also passes more slowly in proximity to a black hole because of the strong gravitational effects. It’s just one more challenge to be overcome if humans are ever going to travel deep into space.